Finally, a cloudless night — perfect condition for a fresh attempt to photograph Jupiter. I went home from work in anticipation of another moment to look at this very bright object, as it sat above The Hunter and The Bull’s heads. While trying my best to capture decent photos with my point and shoot camera, I’ve realized two things: 1) I need a better camera, and/or 2) I need a better telescope. But if I were to prioritize only one of the two, I’d prefer the latter. I love my Meade ETX-60 as it is perfect to view nebulae and other cluster formations, but I would have liked to step up my planetary experience. I know that I have previously resolved on getting a new telescope after my school commitments. But as a lot of things had happened immediately (or even during) those tasks, I had to postpone the purchase because well… I have already spent my telescope fund for more worthwhile things. 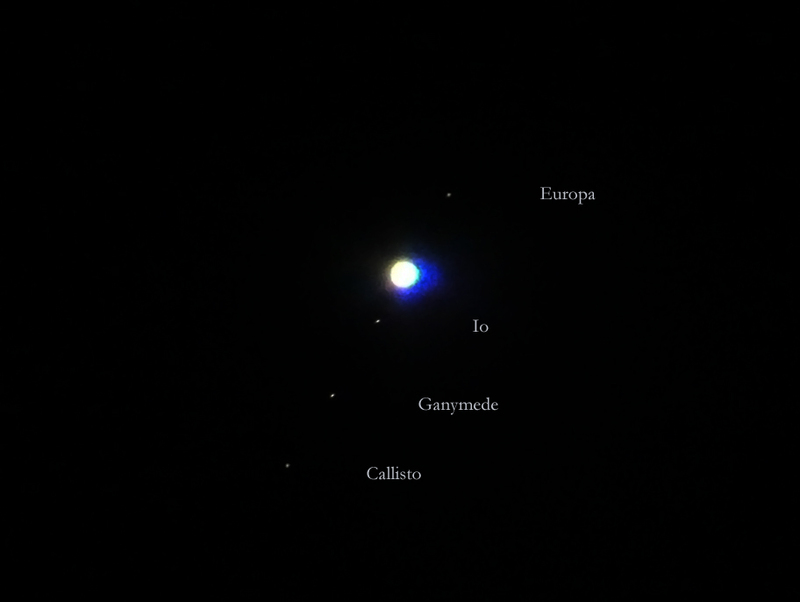 Anyway, seeing Jupiter and the four Galilean moons still made my night. The picture above can nowhere capture how wonderful seeing that planet suspended in the sky, but I still love seeing Saturn’s rings because they are forever magnificent. I also braved our street, setting up my telescope and two chairs in front of our house, with a sling bag carrying the eyepieces, a digital camera and my cellphone. I was that determined to use my telescope that I just went extra cautious of my surroundings because I might get mugged. LOL However, as our house extension’s rooftop was about to get built, I will claim the place and make it my makeshift ‘observatory’. But I will have to wait by mid-November in order to do that once it is finished. Not literally. But since October 20, 2012 is Astronomy Day, I decided to take my telescope out after several months of being inside its box and look up to the heavens. Any amateur enthusiast or professional astronomer must do something astronom-ish for the night. LOL However, the wonderful clouds went in the way and I wasn’t able to see other things, except for the Moon. Don’t get me wrong. 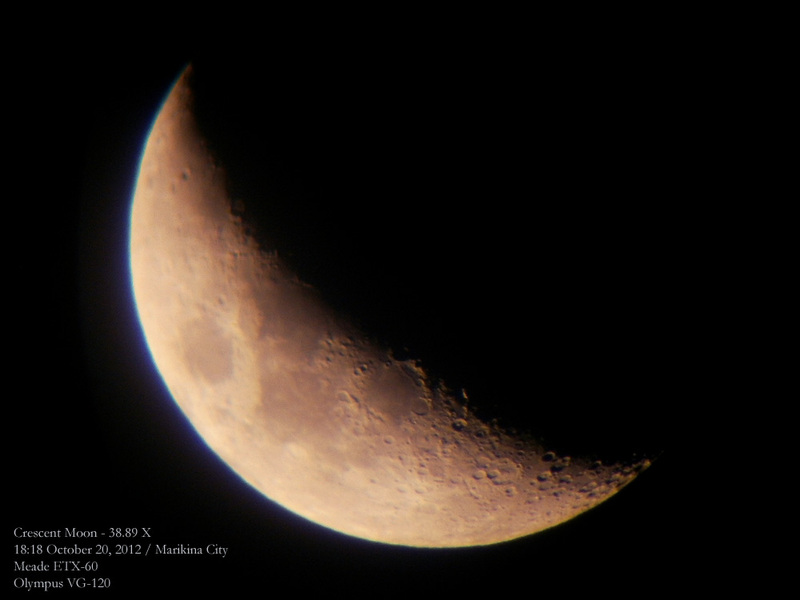 I am in LOVE with the Moon, but I was hoping to catch a glimpse of other celestial bodies. I took this photo of the moon almost half past six, and Jupiter wasn’t due until about almost ten from where I was located. I borrowed my brother’s bridge camera, just to try my luck in capturing Jupiter, because I had been having a hard time with my point and shoot camera (which I used for the photo above — but I was also wondering why my photos using the same camera this time were not that good as before). As I went out of the house four hours after, I immediately saw Jupiter almost above me and unobstructed — perfect condition because it meant less turbulence in the atmosphere for my optics to penetrate through. But as I was already searching for it, first with the 25mm eyepiece, then with the 9mm eyepiece, I could no longer see it. Thanks to the clouds. Ugh. I was cursing under my breath, no, loudly and Mon had to remind me to lower my voice. We were in the middle of our street.